In a recent speech delivered before the scientists attending the 102nd edition of the Indian Science Congress, Dr. Harsh Vardhan is reported to have said: "Our scientists discovered the Pythagoras theorem but we very sophisticatedly [!] gave its credit to the Greeks' (The Times of India, 08 January 2015). Mr. Vardhan is not a non-entity; he is a Hindutvavadi Bharatiya Janata Party (BJP) stalwart and at present the Union Minister of Science and Technology. Mr. Shashi Tharoor, a Congress Member of Parliament (Lok Sabha), shelving his opposition to the ruling BJP, supported Vardhan in a series of tweets. He said, '... the Sulba Sutras, composed between 800 and 500 BC, demonstrate that India had Pythagorean theorem before the great Greek was born' (The Hindu, 08 January 2015). There is nothing new in this claim. Dr. George Thibaut, the scholar who first studied the Sulbasutras in detail and translated one of them, had mentioned the Pythagorean Theorem in relation to the Sulba geometry as early as 1875 in an long essay published in the Journal of the Asiatic Society of Bengal. All histories of mathematics in general and of geometry in particular also recognize this similarity. But what the hon’ble minister and the opposition MP have stated is a curious mixture of half-truths and downright lies. Let us see where both of them went wrong. A few words about the Sulva (or Sulba)-sutra first. It is admitted on all hands that the rudiments of geometry in India developed from that branch of the six Vedanga-s (lit. ‘limbs of the Veda’) called Kalpa. Vedic priests connected with the Yajurveda were supposed to learn this particular ancillary literature of the Veda. The Sulbasutras form a part of this Kalpa. They deal with, among other things, the piling of the fire altar, variously called Agni, Cayana, Citi, and Vedi, required for the Soma sacrifice (yaaga). The altars were made of kiln-burnt bricks. The bricks are of different shapes and sizes and required the skill and experience of the manual workers (not sages or professional scientists), such as, brick-makers and masons. And here is the crux. The masons used ropes and bamboo in their work. The word sulba means ‘rope’. In the texts of the Sulbasutras of different schools, the word rajju (cord) is used throughout. They had no ruler and compass, and so all operations had to be made and measured with ropes and bamboos. There was no geometer, no scientist when the bricks were burnt and Vedis were piled. Whatever knowledge was acquired from such operations were essentially empirical in nature. Therefore, the very idea of a theorem is not to be expected. So Mr. Vardhan’s praise of ‘our scientists’ is beside the point. Why state the same in two different aphorisms(sutra)s? We must remember one significant fact: the Sulbasutras recognize only the caturasra, quadrilateral. There is no concept of the trilateral as such. The Pythagorean Theorem, however, is concerned with the right-angled triangle only. It runs as follows: ‘In right-angled triangles the square on the side opposite the right angle equals the sum of the squares on the sides containing the right angle.’ There was, however, no concept of angles and their measurement by degrees in ancient India. Only one type of trilateral is referred to by name: Praüga, the isosceles trilateral. Praüga is the name of the fore part of the shafts of a chariot. An altar is also named after it. The word, tisra occurs in relation to a particular kind of brick (Baudhayana Sulbasutra, 4.61), a right-angledd trilateral. The Manava Sulbasutra mentions trikona (10.3.7.6) but one side of this trigonal brick is curved. In any case the word, kona, does not stand for ‘angle’ (as it normally does today in many North Indian languages), but simply means ‘corner’. Thus panchakona in Manava Sulbasutra, 10.3.7.6 suggests a five-cornered figure. In the same way, the oblong (rectangle) too was divided into several such parts and each was accorded the name of its own. Hence the so-called Pythagorean Theorem is stated twice in the Baudhayana Sulbasutra: first in terms of a square [Proposition (a)] and then in terms of an oblong [Proposition (b)]. One may object that even though the trilateral was formed out of a square or an oblong, it was there, and therefore, there is nothing to prevent us from claiming that the so-called Pythagorean Theorem was ‘discovered’ by the Yajurvedic priests. Unfortunately, the texts of the Sulbasutras in which the statement resembling the Pythagorean Theorem occurs gives a lie to such a claim. Some examples of the application of the proposition are also provided in another sutra: in connection with an oblong the sides of which are 3 and 4, 15 and 8, 7 and 24, 12 and 35, 15 and 36 (Baudhayana Sulbasutra, 1.49). One can easily see the relationship between the sum of the squares on the base and the perpendicular being equal to the square on the hypotenuse. Thus, 32 + 42= 52, 152 + 82= 172, 72 + 242= 252, 122 + 352= 372, 152 + 362= 392. The same proposition also occurs in Apastamba Sulbasutra, 5.5, etc. and Katyayana Sulbasutra, 2.11. But no attempt at generalization is ever made. Any attempt to prove that the so-called Pythagorean Theorem (Proposition 1.47 in Euclid’s Stoikhna, in English Elements) was known in that very form in India before Pythagoras (flourished about 530 bce) is futile. First of all, the dating of the Sulbasutras is conjectural, but it cannot be earlier than the 600 bce. The dating of ancient Indian texts is always problematic: unanimity of scholarly opinion is seldom to be expected. (We have followed the chronological table given in the opening pages of A. N. Ghatage and others (eds.) An Encyclopedic Dictionary of Sanskrit on Historical Principles. Poona: Deccan College, Volume I, 1978). In any case, such claims and counterclaims have long ago become meaningless, since it has been decisively proved that the ‘theorem’ was known in Old Babylonia at least twelve hundred years before Pythagoras. (A. Seidenberg, ‘The Geometry of the Vedic Rituals’ in: Agni, Vol. 2, edited by Frits Staal with assistance of Pamela MacFerland, Berkeley: Asian Humanities Press, 1983, p. 101. For the Cuneiform texts containing Pythagorean numbers (and triples), see Midonick (ed. ), Treasury of Mathematics. Harmondsworth: Penguin Books, Vol. 1, 1968, pp. 29-35). Both Mesopotamia and China too have a claim in having a glimpse of the Pythagorean triples. (Carl Benjamin Boyer (1968). "China and India". A history of mathematics. Wiley. p. 229; S. N. Sen and A. K. Bag, The Sulbasutras. New Delhi: Indian National Science Academy, 1983, pp. 10-11, 154). Even if the redactors of the Satapatha Brahmaṇa were aware of the theorem (as Seidenberg says, p. 106), the work cannot be pushed back to 1900-1600 bce. We should rather note that the theorem was formulated in India out of the practice of craftsmen quite independently of Babylonia or Greece or China. The same statement would be true of Greece and China as well. Here is an excellent example of polygenesis: the same conclusion was arrived at in different ancient civilizations, unbeknown to one another, all on the basis of empirical observation. 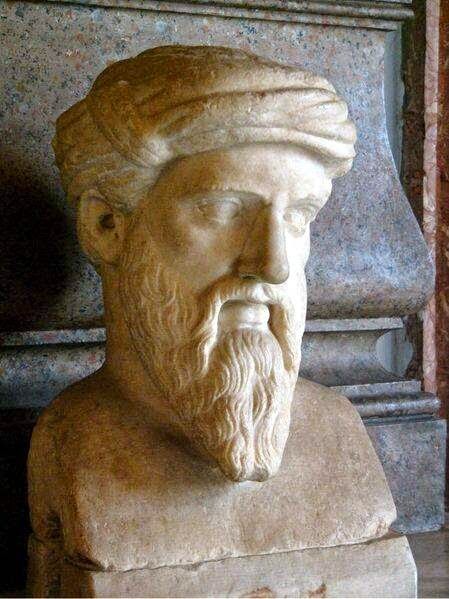 Euclid provided a general theorem true for all right-angled triangles and attributed it to Pythagoras, and there lies his credit. His predecessors could only think of and note down several cases, but stopped there. Dr Ramkrishna Bhattacharya taught English at the University of Calcutta, Kolkata and was an Emeritus Fellow of University Grants Commission. He is now a Fellow of Pavlov Institute, Kolkata.